Westford, MA and London, January 26th, 2016 – Voltage Pictures is the international film financing, production and distribution company behind 150+ features including The Hurt Locker and Dallas Buyer’s Club. Its films have been recognized with nine Academy Awards® and 15 nominations. Bringing 20 films a year to market, Voltage is typically in production on multiple projects simultaneously. With teams of producers, directors, cinematographers and crew changing constantly, having a dailies viewing solution that is enormously easy to use but also provides a level of control over access and functionality is fundamental to their business. 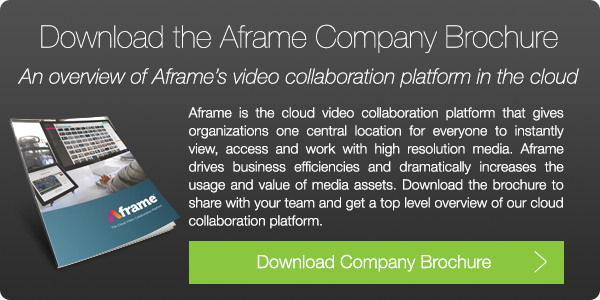 Aframe is their cloud-based system of choice. Voltage Pictures first began using Aframe in 2014 on the sci-fi thriller Revolt, and they have since standardized on it, using Aframe to view dailies on Lady Bloodfight, I.T., The Headhunter’s Calling, the upcoming sci-fi thriller Colossal starring Anne Hathaway, and Going Under, which is currently in production. While Aframe is a full-featured review and approval system that supports collaborating directly on high-resolution video files, Voltage Pictures’ implementation is simple and straightforward; they use Aframe purely for dailies viewing. A DIT or assistant uploads H.264 clips of the full day’s shoot as a playlist at the end of each day, usually from the set, and makes them available for viewing via browser immediately by producers, directors, cinematographers – anyone invited, who can watch them anywhere in the world, anytime, on any device. Foreman typically accesses Aframe from his iPad and uses AirPlay to project dailies onto his office wall via Apple TV. “It couldn’t be easier. Someone on set uploads them in a file size that is easy to distribute and nice enough so that the director and DP can see what’s going on,” he said. At Voltage’s request, Aframe made a recent update to the player to streamline the viewing process even further, by enabling clips in a playlist to play out back to back in a string-out instead of having to be launched individually. “That kind of responsiveness is why we really like working with Aframe,” Foreman said. With films starting and wrapping frequently, Voltage is in a continual state of inviting new users into Aframe and rolling them off when they’re done. “Inviting people into the dailies process and ending their access is much easier with Aframe than it is with some other systems,” Foreman noted, “and people are able to get up to speed fast whether they’re viewing or uploading.” Because Aframe is a private cloud with globally located data centers, Voltage is also assured of needed high-speed access and security anywhere in the world. Beyond protecting media files, having the ability to restrict access and functionality dynamically in Aframe also enables Voltage to protect the privacy of its celebrity producers and directors; as was the case on a film where Aframe introduced a new capability at Voltage’s request that allowed them to hide designated email addresses from view by other users on the system. While working on Colossal, Voltage began to extend the capabilities of Aframe to its Marketing and VFX teams, having photographers upload full resolution productions stills that Marketing teams would then download for immediate use, and sharing H.264 video files from dailies with the visual effects company to use as references and facilitate pre-visualization.